Nexus 4 owners, don't lose hope. Though your 2012 Google phone was cruelly looked over for the developer preview builds of Android L (along with everything that wasn't a Nexus 7 2013 or Nexus 5), sharp-eyed Google+ users have spotted two different Google employees posting on the Chromium section of code.google.com claiming to use the Nexus 4 with Android L. Check out this entry from a contributor with a Chromium.org email address, explicitly using the "LRW52G" build of Android on his or her N4. The latest N5 build of Android L is LRW66E. That gives us some real hope that Android L will be making it to the current penultimate Nexus, along with the initial partial support from the AOSP code released in July. Of course, it isn't written in stone. Just because Google employees have an "official" build for the N4 doesn't mean that we'll see it at launch - after all, they could simply be evaluating it for hardware viability. But Google has already committed to updating the new Android One devices to the next major release of the OS, and those phones are considerably underpowered compared to the Nexus 4. Based on that admittedly anecdotal evidence, I'd say that an update to Lemon Meringue Pie (or whatever the next Android version is called) is more than likely. 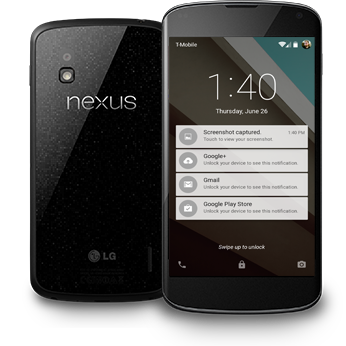 We're expecting a full Android L rollout and at least one new Nexus device before the end of this year.